I'm no expert but when I looked at the server on Friday evening the CPU did not look like it was overloaded so I'm not sure what the problem is. I'd hold off while I tinker with the Dserver settings and see how things go. Silver. Have you tested? I tried in my training server and I set up 4 road check point structures (not huge, but not tiny targets) and got the exact Lat Long for those and tried dropping 4 on a single target (1 per pass). The first one was off by a few hundred feet so I figured I had released early (even though it had said I was in range). For the next drops I got higher and waited longer. The 2nd one was maybe 50-100 feet short. 3 and 4 both hit almost exactly the same place and were maybe 20-50 off ... one was close enough that it did 1% damage to the target. 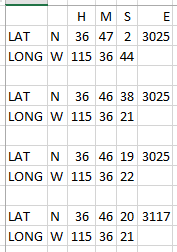 I'm going to try the suggestion made earlier to use UTM coordinates and convert those to lat long and see if that changes anything for accuracy. The video from Wags goes through the process step by step. I'm testing it tonight. Thanks Scorp - I noticed last night when I was engaging the P39 that it was rubber banding (forward/back/forward) a little, so I could tell the sim was having difficulty keeping the clients in synch with the server. Is there anything I can do on this end, like any upgrades or such? My Xfinity modem has the following speeds: 560 download/41.6 upload measured through Xfinity. Using a standard test on the Internet, they show speeds of 60.1 megabits/sec download and 40.9 megabits/sec upload. No idea why they are different. You can check the CPUZ program on the server system for all server system information. I'm maxed out on how much RAM the motherboard will hold. The MB and CPU are several years old now though.